I always struggle to find good activities to address higher level language concepts such as inferencing, predicting and problem solving. I often know what I want to work on, but finding the right tool that is motivating is another battle. But of course with the iPad…anything is possible. Recently I found the app Lemonade Stand. 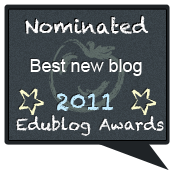 I can’t remember who recommended this to me (probably the genius Sean Sweeney at www.speechtechie.com), but it any case I’m grateful. Today it became an app that I used individually and in the group setting. 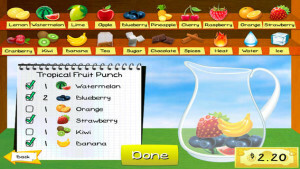 The app is essentially a virtual lemonade stand, where you are given conditions (a weather report, and potential events in the area), and then you are to decide how much lemonade to make, how to make it, how to advertise, and how much to charge. An obvious lesson in basic economics…but that is NOT what my focus was (I steer clear of math if possible). Instead, we brainstormed ideas for what would make people want to come to a lemonade stand (weather, good tasting lemonade, fair price, good signs, etc.) and what would keep them from coming back. We then created our own lemonade sign, which was a great perspective taking activity (and in a group- teamwork and flexibility activity). What information needed to be on the sign (and why!) and how it should look was a session all on it’s own! We then played the app. In a group, a great opportunity for negotiating language, flexibility, and tone of voice as you discuss your ideas. Individually, great for discussing “why” you make changes to your plan. For example, “I added more lemons because I wanted the lemonade to taste better so more people buy it,” or “I charged less for the lemonade because the weather is yucky and I want to sell some.” There are no really right answers, as long as they support their idea. The app provides some “tips” in their information section which is great to have kids refer to if struggling. There are lots of opportunities for therapy….and it was lots of fun too. What’s So Hard About Breathing? I’m always looking for activities to work with my late elementary and middle schooler students on critical thinking/problem-solving and perspective taking skills. It always seems challenging to find the right material to address these concepts in a one-to-one therapy setting. 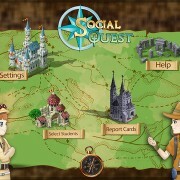 Recently, I’ve been using the Social Quest App from Smarty Ears to do so. It offers a great starting-off point for discussion around a variety of social concepts. The concepts are broken down into various contexts such as community, home, and school. 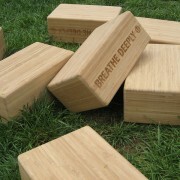 The student or therapist selects a context, and the student is “transported” there, and then provided with social situations to problem solve. The app is set up in a game like format, set in the Renaissance era (which students really love), and provides rewards along the way as the student progresses through the questions. You can use in a group setting or individually, and it saves your data which can also be emailed/shared with parents. 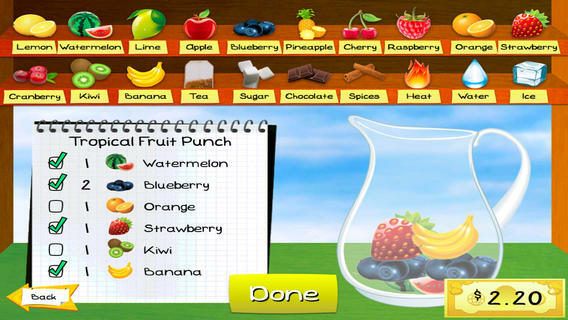 I’ve been pairing this app with other therapy strategies including Social Thinking’s © Social Behavior Maps, a variation of Comic Strip Conversations ©, and even basic role play to assist students with problem solving the various social situations. Self made thinking and speaking bubbles have also been helpful to assist students with problem solving various situations when they are “stuck.” The settings allow various ways to adjust difficulty level. I’ve even been using a “low tech” means of covering up answer choices on the screen with good old paper, and having the student generate their own outcomes. They then can look at the provided choices, and make their decisions as to the “best” answer. This app has been a great tool in recent therapy sessions, and led to important social discussions. For a more thorough review on the ins and outs of this app see Constantly Speaking who recently did a great post. *all4mychild was provided with a promotion code for the Social Quest App, however the post is reflective only of Meghan’s personal opinion. Description: Bear wants to be a comedian but suffers from stage fright. He and his friends come up with a creative solution to his dilemma. 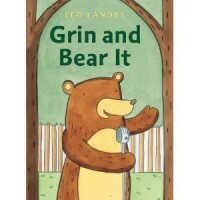 Why I liked this book: The bear with stage fright is relatable to kids and adults of all ages. When Bear is embarrassed, his friends help him problem solve rather than laugh at him. The first four chapters are titled: A Dream, A Plan, Ready, and Showtime depicting steps we want our kids to follow for any challenging assignment or task. The illustrations make me want to hug this book! Read the 7 short chapters over a period of several days to allow time to explore all this book has to offer. Discuss the steps to accomplishing something that the kids want. Have them create the idea, make a plan, and prepare before diving in. Discuss words and terms like “stage fright”, “embarrassed”, “rehearse”, and “nervous”. This is a great opportunity to also discuss physiological responses to anxiety and ways to help decrease it through deep breathing, yoga, visualization, and other ideas. When Bear falls apart, ask the kids to offer suggestions on how to solve his problem. What should he do? Give up? Try again? How could he be more successful the next time? Discuss what good friends would do if they saw someone struggling like Bear. Have kids practice and tell jokes to one another. It’s a great way to help them understand humor both through spoken words and body language. What makes a joke funny? As always, I love having kids act out stories and this is a great one for that. 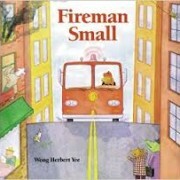 Please support books4all and order this book from Amazon.com. Thank you! 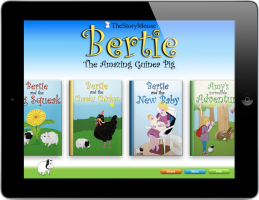 Description: Meet Bertie, the guinea pig, and join him as he helps his new friend, Jenny, find her squeak. – A great story to “act out.”. One of you can squeak and one can’t. Have fun finding objects to “be” the various places they looked for the squeak. – Act out and point out the body language. How does the character feel? Why? How can you tell? – A great book for discussion of how wonderful it feels to help someone else solve their problem. Share stories of times when each of you has helped a friend find something lost, or in some other way. Talk about how problems are best solved when everyone’s ideas are taken into account.